Tesa Danusantoso, a senior at the College of the Holy Cross, studied abroad in Lima, Peru, from July to December 2017. 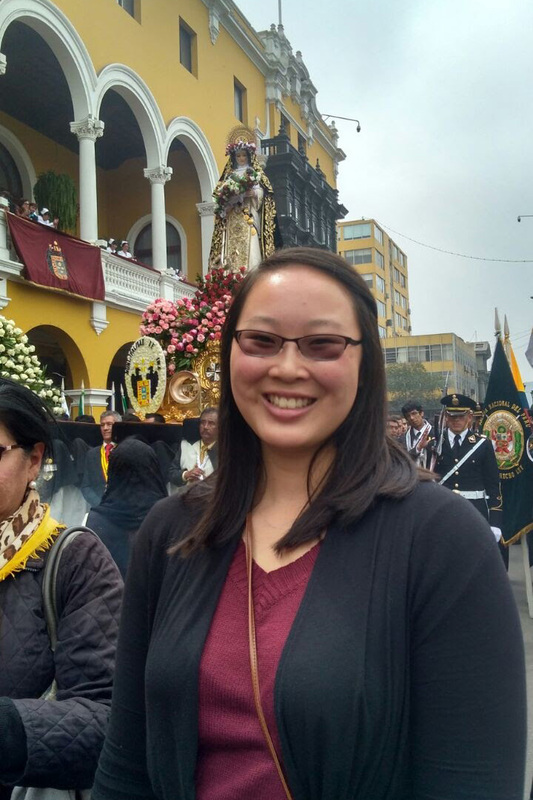 She shares her experience attending the feast of Saint Rose in Lima, August 30, 2017. Besides the feast, her favorite memories from Peru are of sand boarding on dunes and a nighttime barbecue in a desert oasis. Her favorite Peruvian dish is ceviche. A double major in Spanish and biology, she is currently exploring medical school after graduation. Who was she and why is she so important to the city of Lima and to the country of Peru? Those were the questions that ran through my mind when I first heard that August 30 was a national holiday in Peru. As I learned, Saint Rose of Lima was born in Lima, Peru, in April of 1586. She is known for her piety and her chastity and is Peru’s patron saint. She became a member of the Third Order of Saint Dominic and used her position in the Order to tend to the Peruvian homeless population. 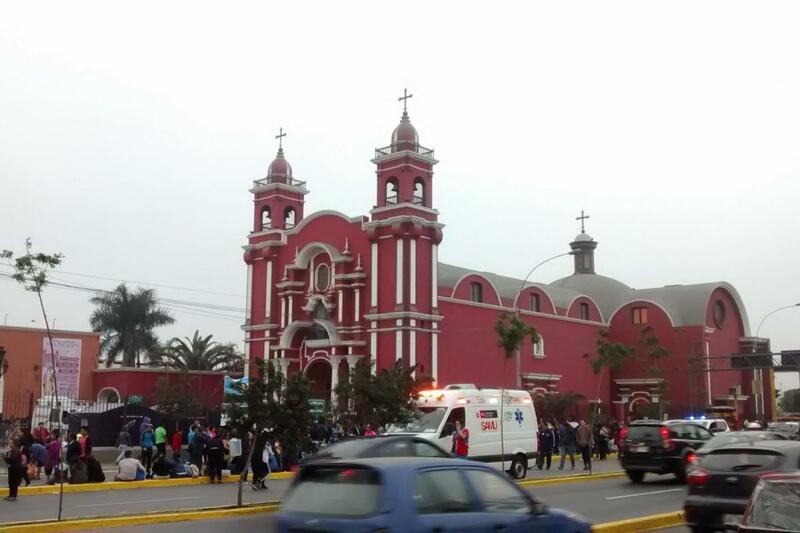 This act of service soon became characterized as one of the first events of social service documented in Peru. 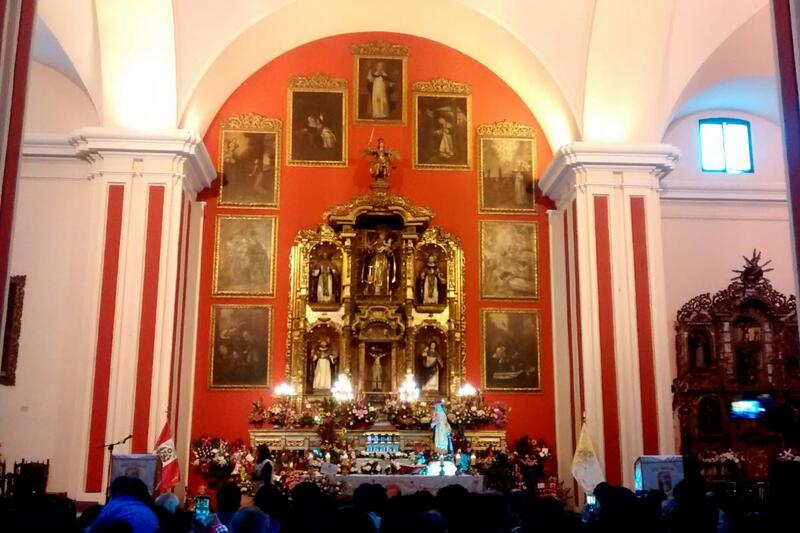 During her 31 years of life, Saint Rose helped countless Peruvians and had a great influence on many more, so much so that prominent men in society took turns carrying her coffin while the entire city mourned her death in August of 1617. Even 400 years after the death of Saint Rose of Lima, the entire city and country still mourn her. The mourning now is different than it was back in 1617, but the foundation is the same—remembering the life and works of Saint Rose and praying for her intercession and the repose of her soul. Instead of men taking turns to carry her coffin, groups of men take turns carrying her statue adorned with roses around downtown Lima. 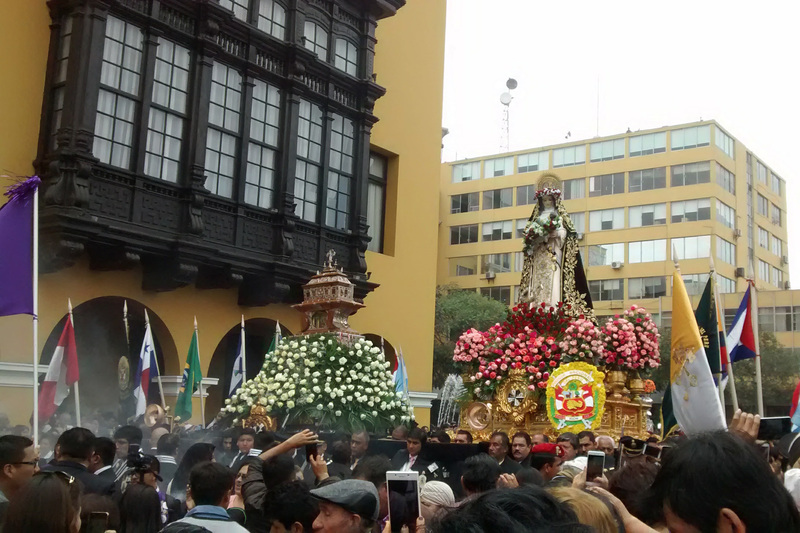 This procession lasts all day and all evening and the crowds following the statue never dwindle in size. A band also follows the statue, and they continuously play their instruments until the day is over. When I say that the crowd sizes were insane, I am not exaggerating. People of all ages were present. 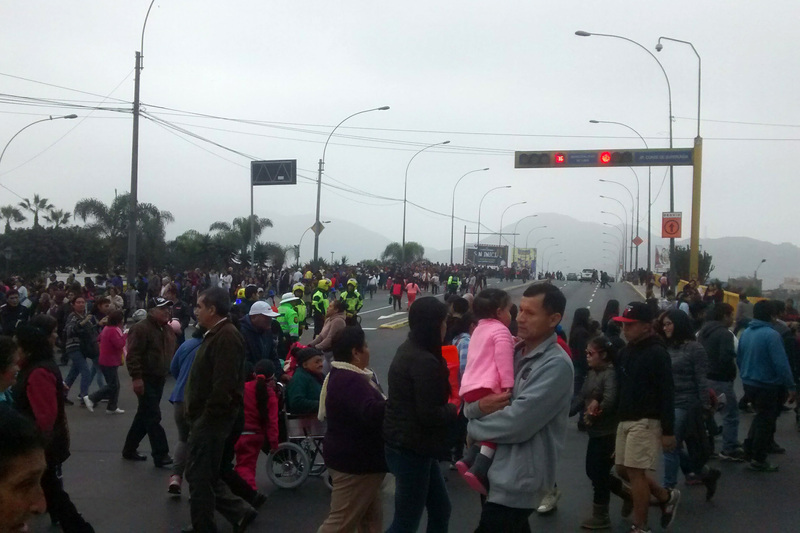 The young, the elderly, the babies, and even the dogs were in downtown Lima to pay their respects. 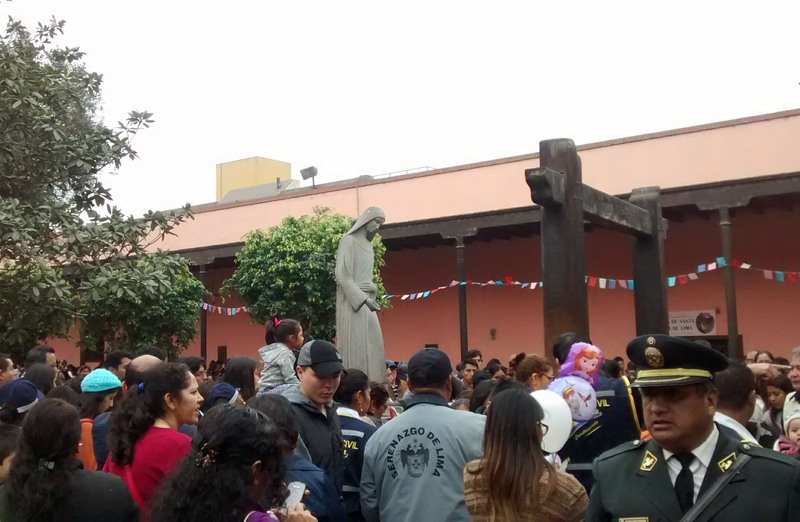 The crowds were at least 15 people deep, everyone pressed in on each other, without a care for personal space—all just to get a glimpse of the statue of Saint Rose of Lima and, if lucky, to get a picture with her. 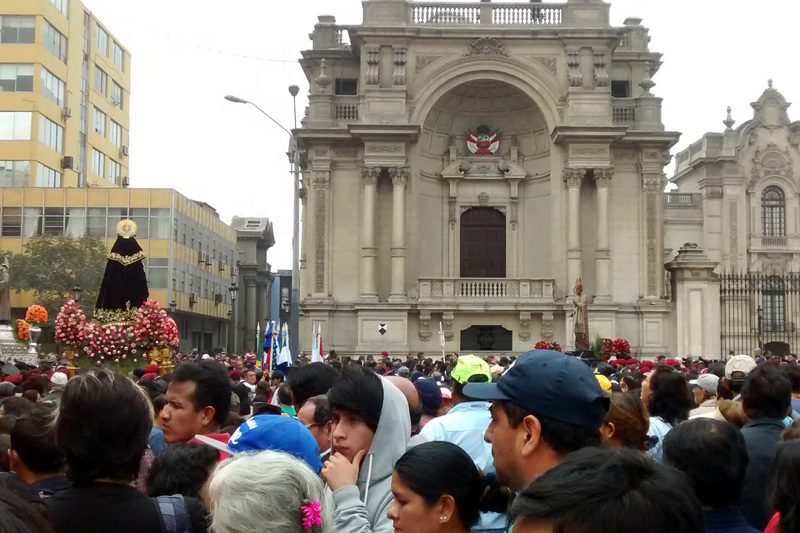 Fortunately for me, I got to see Saint Rose just fine from where I was—near the back away from the chaos—due to a good camera and the fact that I was taller than most of the Peruvians in attendance. The best comparison of the crowd size I can think of is the number of people who show up for a big sporting event—all seats sold out with about twice as many people standing outside the stadium also in attendance. There was the same amount of fervor, but not one of materialism. The religiosity and the intensity with which the Peruvians celebrated Saint Rose’s feast day was noticed in every aspect of life: the TV had all day, live coverage of the Church of Saint Rose and the procession; portraits of Saint Rose were drawn in chalk on the streets every few blocks; all the buildings in downtown Lima displayed roses or some sort of floral arrangement (Saint Rose is also the patron saint of florists), and so much more. 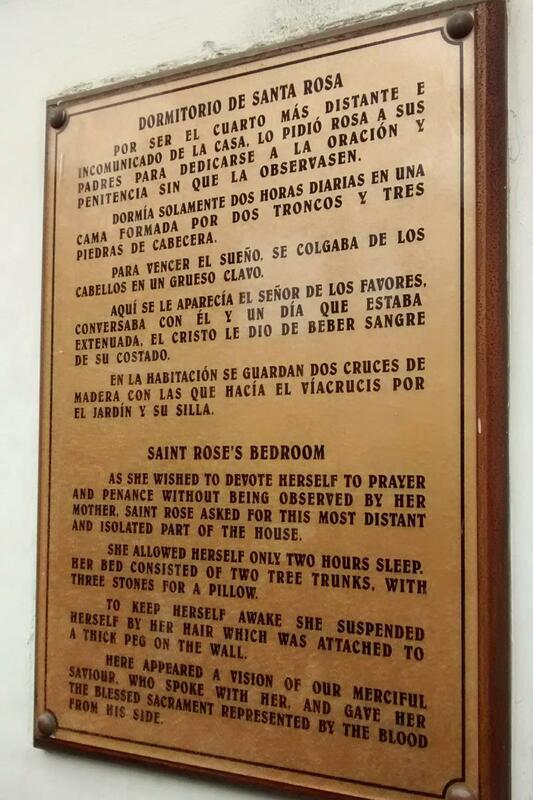 One of the traditions on the Feast Day of Saint Rose of Lima is to go to the church and sanctuary of Saint Rose of Lima and throw a piece of paper with a petition written on it into the well. Throwing the petition into the well is the physical manifestation of letting go of one’s worry and letting the grace and mercy of Saint Rose take care of it. It is such a big part of the celebration that the government placed security around the well so as to keep the line moving and make sure that no one could spend all day at the well. Security is so strict at the sanctuary they almost didn’t let me take a picture of what the well looked like. Since I was taller than most of the Peruvians, I could take pictures over their heads without getting in other people’s way. I thought the crowds at the procession were crazy, but the crowds at the sanctuary were even more insane. The number of people present was probably the same, but what made it seem more crowded was that the church and sanctuary were smaller, enclosed places. 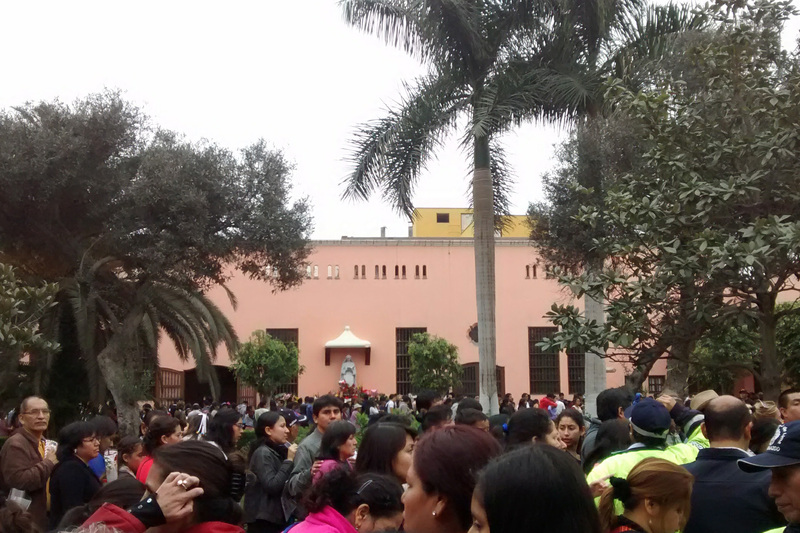 The security guards only let a certain number of people into the sanctuary every 30 minutes. The rush to enter the sanctuary when its gates opened was so hectic and competitive that even the most elderly ladies were pushing people out of their way to get to the front of the line. They might have been elderly, but they sure weren’t weak. It took them them less than a quarter of the time it took me to get to the well. These ladies were the epitome of women on a mission. They stopped for no one, except Saint Rose of Lima. There were two ways to get to the well. One was entering through the church and the other was to enter directly into the sanctuary. Both ways had extremely long lines. The line to get into the church was so long, it crossed the nearby bridge and went on into the next district over. 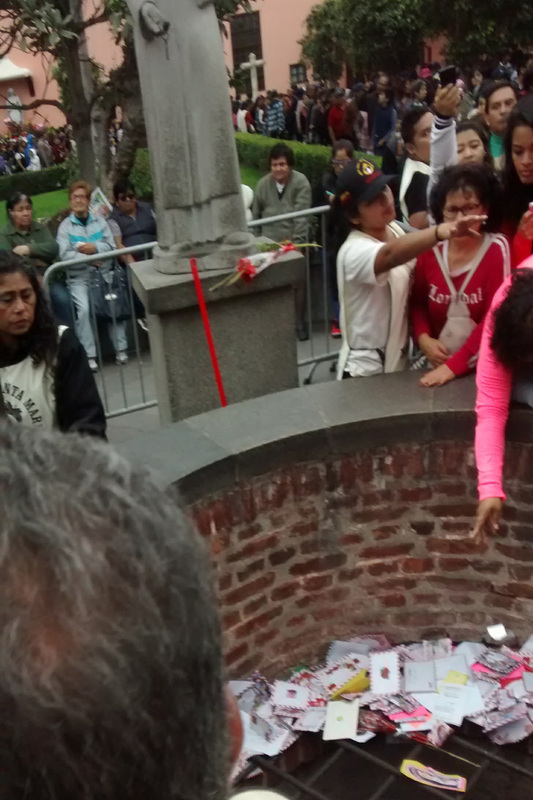 People were waiting for hours just to be able to get a glimpse of the interior of the church and throw their petition into the well. The line to enter the sanctuary was so long that, even though the line wrapped around itself multiple times, the line still didn’t end until a few blocks over. Even after the sun had set, there were still so many people waiting that people were running as the line moved up so they could throw their petition into the well before the well closed for the night. There must’ve been a lot of luck on my side or someone was definitely looking out for me, because I got to the church at just the right time. I was near the front of the line to get in the church and only waited for maybe 20 or 30 minutes before I went inside. By the time I was done looking at what the interior of the church looked like, it was time for the next wave of people to be let into the sanctuary. And, lucky for me, I was already standing near the door that opened up directly to the area near the well. When the doors opened, I stepped out and had minimal difficulty getting to the well. In fact, I was able to witness those strong elderly ladies drop their petitions into the well and say a silent prayer before going on their way. People were out and about even after the sun set—even the procession of the statue of Saint Rose of Lima and the band that went with it were still going around downtown Lima. Stores sold different types of Bibles, Rosaries, candles, prayer cards, and other religious memorabilia. 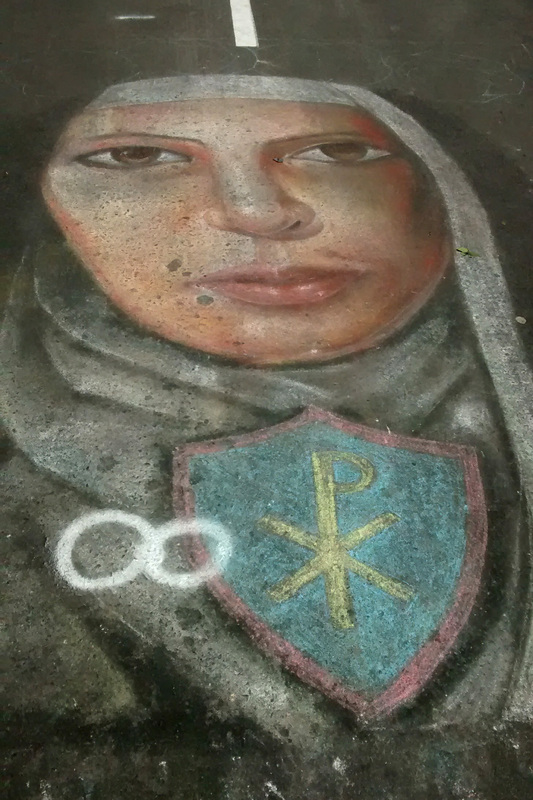 There were images of Saint Rose everywhere around Lima that day. From the beginning of the day to the end of the night, the entire city of Lima was celebrating Saint Rose. For Peruvians, the feast day of Saint Rose of Lima is a day of remembrance, reverence, and rejoicing. The city and the country are unified by and come together to celebrate the life of their patron saint. And I am so blessed to be able to witness it and to be able a part of it. ¡Viva Santa Rosa de Lima!